WHY AREN’T WE BUILDING MORE ZERO BILL HOMES? Perhaps it’s time for the Philippines to join the trend towards sustainability more proactively. The planet is gearing towards eco-friendly housing developments, green buildings, and renewable energy. It’s time that the entire population of the Philippines uses solar energy. What’s the hype on solar about? We need to implement a workable plan to deliver a higher quality of life for Filipinos. That means improvements in energy efficiency and going large scale in terms of renewable energy production. That will lead to a turning point where we can all make a difference in the future of our planet. Where is the future of our construction industry headed? We need to adapt to tools that can deliver this evolution towards solar energy and renewable energy. Rooftop solar is the win-win solution. Everyone is now aware of climate change and fossil fuel hazards. The government promotes it – now we just need to become part of the solution, rather than continue to contribute to environmental problems. It is 2019, and we should now start talking about building houses with zero bills. That is perhaps the most important and phenomenal concept of current technology. Carbon neutral homes with rooftop solar are the ones that can easily produce zero bills. What exactly is a zero bill? It’s pretty simple and straightforward: it means free electricity. Free power. Every homeowner, entrepreneur, and business executive want free power. There is an undeniable clamor for guilt-free power. Imagine every Filipino relaxing in the comforting, cool atmosphere of an air-conditioned room, especially in the midst of the tormenting daytime summer heat of the tropical Philippines. With a solar power system in place, there virtually every single homeowner can become a consumer and a producer of power at the same time. How is this possible? The homeowner simply needs to install solar and avail of Net Metering. Then the homeowner gets paid for providing clean solar power to the grid. He does not just use the power, he produces power as well. The results? First, he will enjoy the benefits and luxury of free power (including guilt-free aircon). Second, he will enjoy the advantage of a zero bill – meaning he pays zero, or nothing, to the electric company each and every single month. Yes, it requires all homeowners to actually get on board. Think zero energy home. Think zero bill home. The trend is contagious. Think about your current electricity consumption. Now, imagine unli-electricity. Zero bill homes are now popping up all over the metro and all throughout the archipelago. The future is all about developing and constructing zero bill homes. The concept is in place. The legislation is in place. The government is in full support. The payback on the investment is clear. The contribution to a safer and healthier planet is eternal. Everyone wants an energy positive home in the Philippines. Through solar energy, your property value increases. It’s reached the point that it’s a no-brainer. 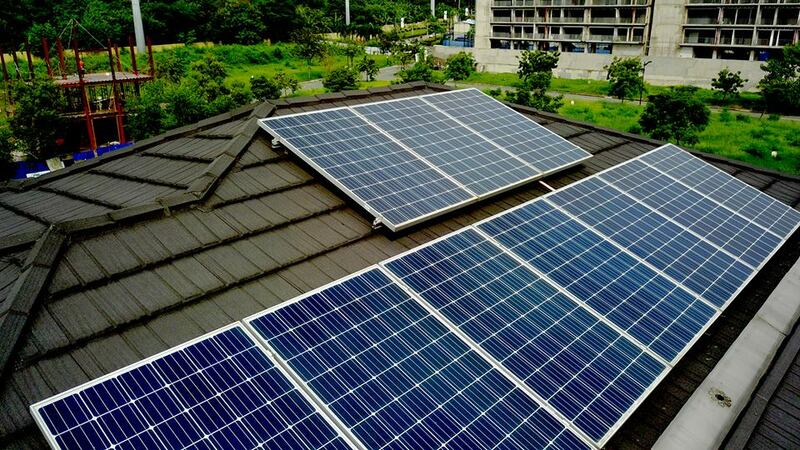 For more information on solar power systems and solar panel prices, please visit www.solaric.com.ph or email us at info@solaric.com.ph call 5040092 or 09178603141. We will gladly explain to you how the system works, or schedule a survey so we can give you options for your new home or existing homes or businesses. At Solaric we Turn on the Sun. Solaric has established its name across the renewable industry as a proven and reputable rooftop solar leader. Solaric has installed more than 50% of residential rooftop solar in the Philippines and has delivered significant cost reductions in electricity expenses, as well as milestone contributions to a cleaner, greener, and renewable future. Solaric is now zoning in on corporate and industrial projects to offer them the same cost reductions. Welcome to the new generation of solar and turning on the sun.